Apple TV lets you choose what you want to watch and when. Built on a powerful platform called tvOS, Apple TV users can interact with their TV in new ways. You can find the movie or TV show you’re in the mood for or turn your room into a game room, fitness studio, or classroom. Indeed, through apps, Apple TV gives you access to the most riveting entertainment content. Apps like Netflix, Treehouse TV, and iTunes have extensive catalogues of hit movies and TV shows. CraveTV and Crackle bring you Hollywood blockbusters and binge worthy original series. You’ll also find your favorite professional sports, breaking news, weather, fun stuff just for kids, educational programming, music, and thousands of free podcasts on almost every topic imaginable. 1.1 What features does the Apple TV have for visually impaired? 1.2 What about the hearing impaired? 1.3 What about help for those with impaired movement? 1.4 What kind of shows can I watch on the Apple TV? 1.5 Can Apple TV play content from any OS? 1.7 How do you reset the Apple TV to factory settings? 1.8 How can a disabled user activate VoiceOver? 1.9 How do I find out which wireless network an Apple TV is using? 1.10 How do I switch from one Apple TV to another using Apple Watch? What features does the Apple TV have for visually impaired? Answer: tvOS enables users to watch movies with audio descriptions of what is being shown on the screen. Movies with audio descriptions are displayed with the AD (Audio Description) icon in the iTunes Store for tvOS and in iTunes on a Macintosh or Windows PC. An accessibility feature gives the option to increase the contrast on the screen. This feature acts by reducing the transparency of background elements on the movie and tv show pages, menu tabs, and other parts of the operating system. The visually impaired can also turn on a high-contrast cursor to better delineate the focused content. Another option is to turn on Reduce Motion, which in some screen actions, such as moving between app icons on the Home screen and launching apps, are visually simpler. The benefit of this is that this action reduces strain on the eyes. Pairing a Bluetooth keyboard with the tvOS on the Apple TV enables another accessibility feature (an incorporation of VoiceOver). When typing, VoiceOver reads aloud each character that is pressed on the keyboard. Note that the Apple TV is designed to work with the Apple Wireless Keyboard or the Apple Magic Keyboard, but this feature will also work with almost any brand of Bluetooth keyboard. What about the hearing impaired? Answer: Apple TV supports closed captioning (with and without tvOS). Thus, the hearing impaired can experience TV episodes and feature-length movies. Compatible episodes and movies are denoted with a CC (closed captioning) or SDH (Descriptive Audio) icon in the iTunes Store, either on the Apple TV or in iTunes itself. The viewer can customize the captions in episodes or movies with styles and fonts that are more conducive to their hearing and/or visual impairment. What about help for those with impaired movement? Answer: The Touch surface on the Siri Remote is customizable. The fast setting adjusts the thumb movements feature to amplify the distance in relation to how far the thumb has moved on the glass touchpad. When tracking is set to slow, larger movements of the thumb on the touchpad will tune down the distance that is traversed on the screen. This will help those struggling with Parkinson’s or other movement disorders to be able to use the Apple TV in a way that fits their disability. What kind of shows can I watch on the Apple TV? 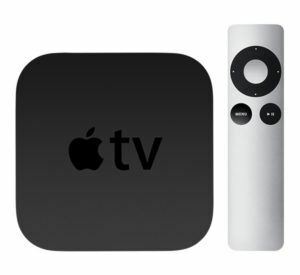 Answer: The Apple TV can receive digital content and stream it to the TV from many sources using its Internet and Wi-Fi connectivity. 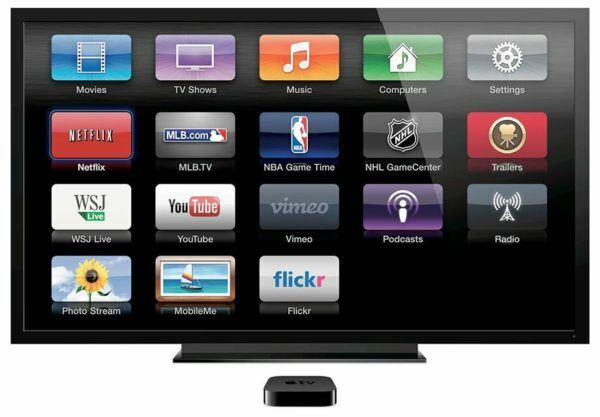 It can play content from the iTunes app using AirPlay, or directly from iTunes, Netflix, Hulu Plus, YouTube, Vevo, Disney XD, news channels, and more, along with many TV cable and broadcast networks, as well as with the video subscription portals of a few major North American sports leagues such as MLB.tv, NBA League Pass and NHL.tv, etc. A certain number of applications enable users with an Apple TV and a satellite, cable, or fiber television login to watch live and on-demand content via the Syfy, E!, Telemundo, and Bravo applications. Certain apps give access to full seasons of the networks’ most popular series, with current and past episodes of all series. Can Apple TV play content from any OS? Answer: Apple TV plays content from any MacOS or Windows computer running iTunes. Answer: If your Apple TV will not boot, or the unit isn’t operating properly, you can restore it by connecting it to your computer and using iTunes to factory reset it. First, unplug your Apple TV. Before you power it back on, plug a mini USB cable into the back of your device (right below the HDMI port) and then to a USB port on your computer. Once your Apple TV is connected, plug it back in. iTunes should open and recognize it. Click Restore Apple TV. Confirm your intention by clicking the Restore and Update button. Once you do this, the latest version of the Apple TV software will install, thus restoring it to working condition. Once the process is complete, you can eject the Apple TV, and it should now boot after you reconnect it to your TV. How do you reset the Apple TV to factory settings? Answer: Resetting your used Apple TV can be accomplished in two ways. The preferred method is resetting it from the settings, when you boot the device up and click through the menus. Alternatively, you can use iTunes on your Apple TV to quickly wipe the device, so any sensitive account data on the item will be erased. This method can also be used when something goes awry, say, the power goes out during an update, or anything else happens that renders your Apple TV unbootable. How can a disabled user activate VoiceOver? Answer: Like other Apple products, such as the iPhone with a three click sequence on the home button to activate accessibility features, with Apple TV’s tvOS, disabled users can activate VoiceOver without any installation process. Simply triple-click the Menu button on the Siri Remote and the Apple TV will guide the user through the complete initial setup, a task that is non-trivial to the visually impaired, compared to most comparable products on the market. How do I find out which wireless network an Apple TV is using? Answer: To find out which wireless network an Apple TV is using, on the Apple TV main menu, select Settings to display the Settings screen. Select General to display the General screen, and then look at the Network readout. How do I switch from one Apple TV to another using Apple Watch? Answer: From the Now Playing screen (in the Remote app), tap Back to display the Devices screen. Turn the Digital Crown or scroll with your finger until you see the Apple TV you prefer. Tap the icon for the Apple TV. Apple TV official website including news, manuals, information about tvOS, accessories and more. We at iGotOffer buy your old Apple TV and all sorts of electronic gadgets for cash and for the best price online. If you forgot to reset your Apple TV before you sell it, just tell us about this misadventure and we’ll do it for you, free of charge, of course: Sell my Apple TV now. In the last year alone, Apple TV has gained a lot of useful features. Here are 5 tips and tricks to help you make the most of your Apple TV.